This is a mate of mine and it comes as no surprise he is doing something along these lines. That's massive! Wasn't there a similar sized one on NZ Grand Designs? down chch way? That one didn't quite get finished but was almost as vast as this one. There was another one done on GD by an Irish guy. Situated in some amazing family land by a creek etc. It was awesome! 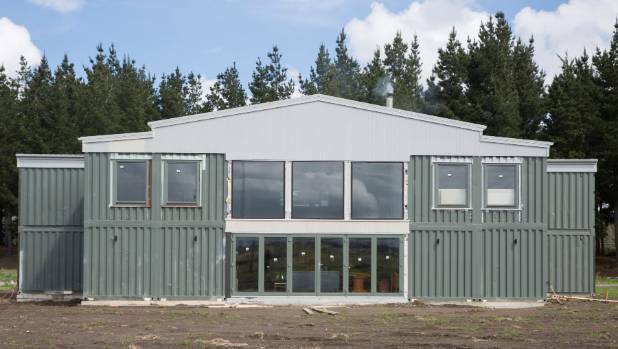 Love this sort of innovation - but while they give you some flexibility there is a lot of structural work to sort with containers plus limited options (as far as I've seen on tv) for insulation. Good to see your mate has done his homework - please bump the thread or share any completion pics! @Hooroo I love seeing projects like that rather than standard cookie cutter McMansions. Man, some structural engineers that I know ... well let's just say I'm not overly surprised. One I saw on UK Grand Designs was two shipping containers, perpendicular. This needed reinforcement (because the strength is on the corners) but turned out fairly special. Was in Ireland? Looks like a barn conversion ... I don't mind it actually. I think that grand designs one is awful. Like most grand designs. @MajorRage I think it looks hilarious - like someone went mental with a garden shed. OK if you like the industrial theme, at least it has deliberate design. The bro in law is doing something similar in the central NI as a weekend house. Instead of containers though he has his hands on some of those prefabricated units used as temporary constructions. The things that look a bit like portacabins but are much stronger. His ones were previously a temporary bridge between buildings during the Waikato hospital building project. He has a very narrow sloped site so these are quite ideal. basically putting together two long buildings on different ground levels joined by a central atrium stairway. Yep, thats out in West Melton, it was a fricking mess. Completely ignored all the point of using containers. Chopped out chunks meaning all the structual integrity of the container was gone & so on. Containers are great for small very basic houses, like a bach. Anything with scale they make no sense. They work in a big place as long as you take an approach like that Australian one where the container itself is embraced as a part of the design eg you don't try and disguise the fact internally. I sort of agree, the fact its 100% a container in most places works & might have been cheaper than a normal build. But anywhere in there that is open plan they've had to put in massive steel beams to hold it together structually. So they could have just built a normal house. The container ones are cheap because a container, with its front door replaced with a big window / door only needs cladding & its done. Its structually great. But as soon as you chop holes in the sides structually its compromised, so you need to spend cash reinforcing. More holes, more reinforcing. Till eventually you end up paying the same as for a non-container house. That Aussie one looks fricking awesome & as an architectual statement I love it. But it looks like a multimillionaire architect looking to make a cool statement as opposed to someone trying to build a house. I mean lets face it, thats a $1.5-$2m property, at least. They are a trade off between the cheapness of using structually solid boxes & the limitations of having closed in darker than usual uniform rooms. Most people try to make the rooms more open & lose the upside of the boxes, while stiill contrained by their limitations.